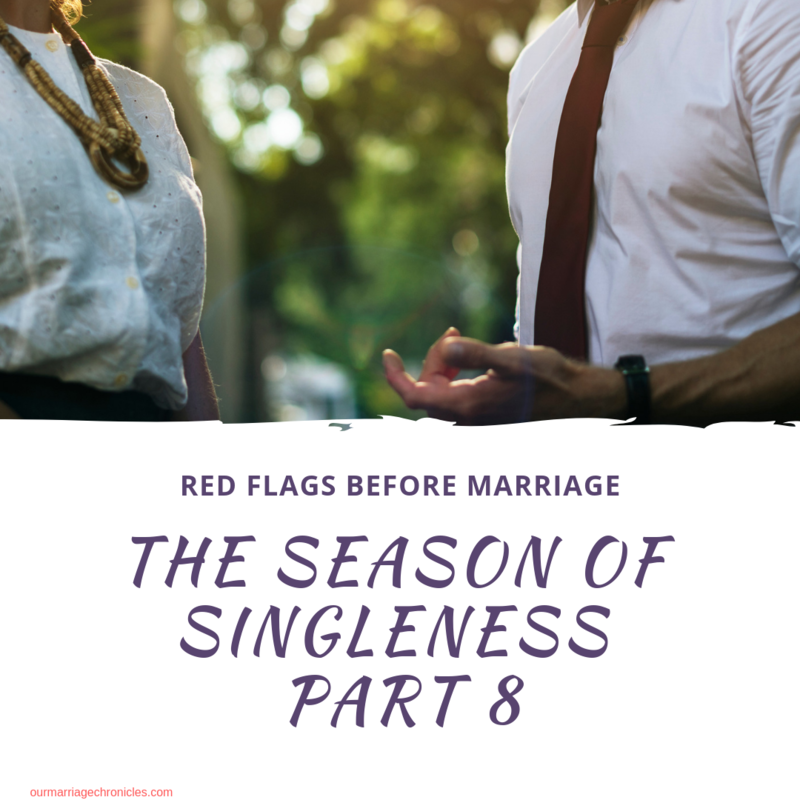 THE SEASON OF SINGLENESS – PART 8 – RED FLAGS BEFORE MARRIAGE. There is God. The Lord who longs for us to develop intimacy with Him through spending quality time in His presence, making His heart known to us. He longs to be known to us, He longs to listen to us. The Bible says that His ears are attentive to our cries – Psalm 34:15. Therefore, you cannot claim to love someone, yet not deliberately put in the effort to spend time, and quality time at that with that person. You cannot claim to love the Lord, yet do not seek Him out. It is virtually impossible to develop intimacy with someone whom you do not talk to. I know how the warm fuzzy feeling down our spines can get us addicted. We are hooked onto the temporary high thinking that it will suffice to build on. But you and I know that those little tickles need to graduate to laborious doings. LOVE then, spells TIME. Am talking about time, intentionally put into knowing this person through communication. Communication is the lifeblood of any relationship. It’s the engine of a relationship and not just a relationship that could lead to marriage, but virtually any relationship on earth. We cannot survive without communication. We need to keep the wheel of information spinning. Without communication, we thrive more on assumptions than knowledge. Nothing could be a far fatal flaw than assumptions allowed to breed and groom up. If pets need occasional pats, strokes and hugs, what of human beings? We who were created for relationships? We who through meaningful relationships find our footing? A relationship, even with the noblest intent at heart, cannot take off without spending time with each other and without communication. If anyone would want to be in a relationship with you but do not intentionally put in the efforts to know you, then they are either stringing you along or are not entirely invested. Doesn’t it seem odd to you when someone keeps giving excuses for not replying a simple text? Or returning a call? Or meeting over so as to talk? There is really no need of forcing yourself on someone who is clearly not investing his/her treasure(time) on you. The writing is clear on the wall in bold letters. – YOU ARE NOT THAT IMPORTANT. “He/she said they are always busy.” True, they might be busy, but if so busy that investing in you feels as if you have to hold them under duress, then you are not that important. Something or someone else is clearly occupying that space. Ladies, why would you make excuses for someone who is not invested in you? Why would you push it? Why would you be that desperate? I know people are different. Some have grown in very unhealthy homes that communication was at best expressed through bashing each other, total submission without being heard or through violence. I understand that. I also understand that different personalities have different ways of expressing deep emotions. I understand that too. But, I am also a firm believer of having a choice to. You can choose to learn to be better at communicating. You can choose to learn how to express yourself. You have a choice. So one shouldn’t lean so much on a wrong past neither on a personality trait that you sabotage your relationship. You have ample time and opportunity to learn. It only requires a good resolve today, a better resolve tomorrow and a greater resolve for the future to learn. We all have to learn. If someone is opposed to learning, then that’s another potential red flag. If you have to keep calling him, texting him, asking how his day has been and he does none of that – if he does, it’s probably because he has a guilty card waved at him, Miss, he is not interested in you. You don’t beg for his time. If you know your value, then you wouldn’t have to keep tagging yourself, “please call me.” If he is interested, then he will pursue you and pursue you well without being distracted. Yes, he could be busy, but any man can find time to get what his heart longs for – don’t get emotionally swindled. Another facet of communication is that they should be active listeners. Not just hearing them talk, but perceiving what they actually say. James 1:19 says Let every person be quick to hear, slow to speak, slow to anger. It’s such a simple principle to read through standing on the holy pews, but so hard to put to practice. Too often, we are very slow to hear, our mouths run amok, and we flare into angry outbursts. Listening is an art to perfect over time it doesn’t happen within the twinkling of an eye. Actively listening to each other helps in understanding each other’s needs while seeking for clarity. Coffee dates aren’t just for fun. They should be taken as glorious opportunities to make your case well known and to understand this person’s view towards a myriad of issues that life could throw at you. Are you the only one steering the relationship? Is he/she enthusiastic about you too? Do you have to push him/her to call you or have a cup of coffee together? Do you have to keep reminding them about discussing an issue you both had in wait? Do they hush you down when you have an issue to discuss? Do they make excuses to evade serious topics? Watch out…you could just be a camper. Love spells TIME.